Product #3195 | SKU DMC842 | 0.0 (no ratings yet) Thanks for your rating! The DMC-842 is both an 8-Channels AES42 interface as well as a controller for digital microphones. 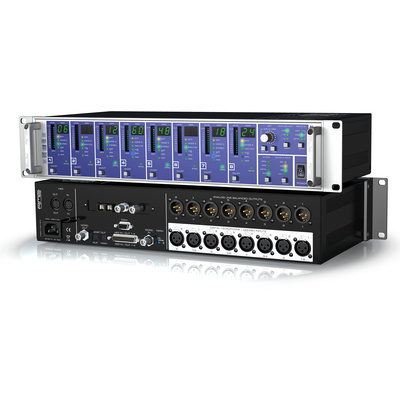 The unique device allows for connection and control of up to 8 digital microphones, and converting their signals to ADAT, AES/EBU, analog and (optional) MADI. When developing the DMC-842, RME worked closely with the microphone manufacturers to secure maximum compatibility and best functionality. As a result the DMC-842 is the most flexible and most compatible AES42 interface available.